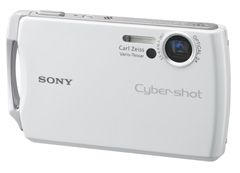 Sony has recently discovered that the paint applied to the body of the Sony Cyber-shot DSC-T11 digital still camera had an increased susceptibility to peeling. Upon discovery, Sony temporarily halted sales of DSC-T11. The cause and remedy has since been identified, and Sony will recommence the production of the cameras. As of Tuesday, June 22, 2004, customers with affected units can contact the customer support center (indicated at the end of this notice) to receive a warranty replacement of their digital still camera. The new DSC-T11 cameras will look different slightly from the original model due to the different type of paint applied to the units. The sales of DSC-T11 will recommence around the beginning of July. *Product may look different from images above. Serial number range: 3010001 to 3033050. 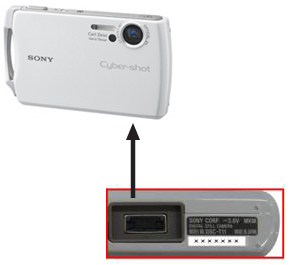 Model name and serial number are located on the sticker attached to the bottom of the camera. We will accept requests for a warranty replacement from May 28, 2004 to May 31, 2005. Customer's personal information will be used solely for the purpose of warranty fulfillment. To this end, this information may be shared with subcontracted parties who are, in turn, prohibited from using it for any other purpose(s).